As fate would have it, I found myself in New Orleans for the fifth anniversary of Hurricane Katrina on August 29th. The mainstream media guys were all over the place with their satellite trucks and all of that, but the feeling I got from most of the local people I spoke with was that they had already moved on, and they didn't need anybody to remind them of the incredible ordeal they've lived through these past five years. 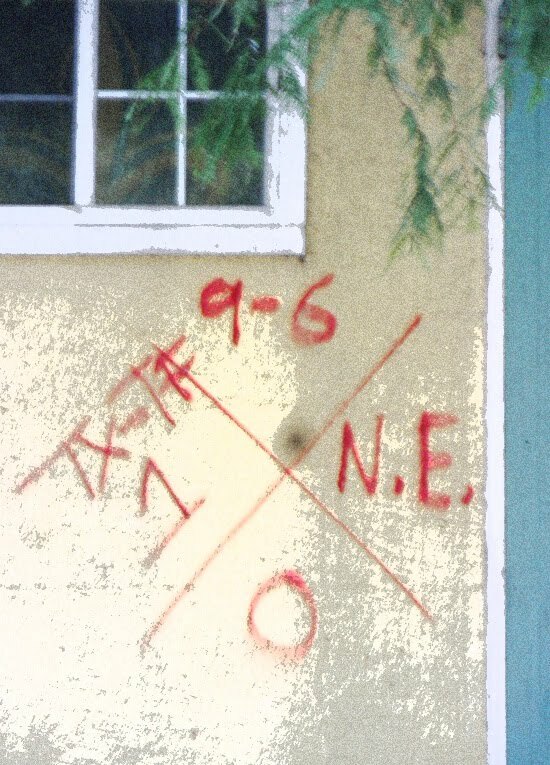 Remnants of the flood are still visible, especially in places like the Bywater and the Lower Ninth, yet New Orleans has managed to survive - with its unique character, and sense of humor, intact. 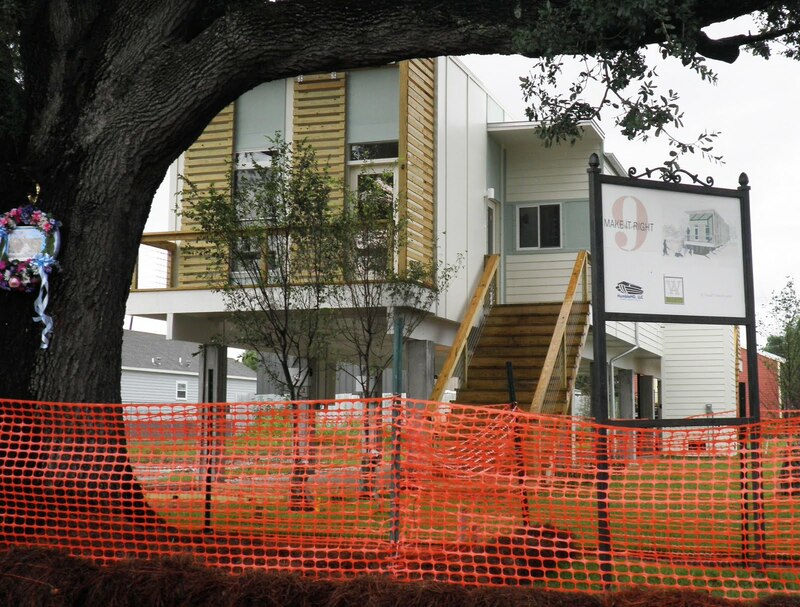 The work that the Make It Right Foundation has been doing has been simply top shelf, and the affordable housing they've been creating just east of the Industrial Canal has been built to last. 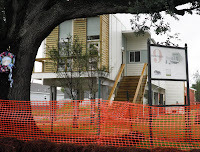 When I last visited that Lower Ninth Ward neighborhood (where Fats Domino was born) in 2006, it was hard to imagine that it would ever be rebuilt, and the powers that be were talking about just bulldozing the whole place... you go Brad Pitt! Anyway, I was happy to support the Foundation by attending the benefit concert that was held at The House of Blues on August 28th, A Night Of Treme. As I'm sure you know, in addition to being the name of the oldest African-American neighborhood in the United States, Treme has also become the name of the highly acclaimed HBO series about post-Katrina New Orleans that 'finally got it right'. The concert, in anticipation of the Treme Soundtrack CD (which will be released later this month), was a raucous celebration of this culture that refuses to die. The band - much to HBO's credit - was anchored by The King of Treme (and heir to the Smokey Johnson legacy) Shannon Powell, and also featured Davis Rogan (the guy they based the over the top WWOZ DJ character on in the series) on keyboards and a host of other local talent. Favorites like Irma Thomas, Lloyd Price (! 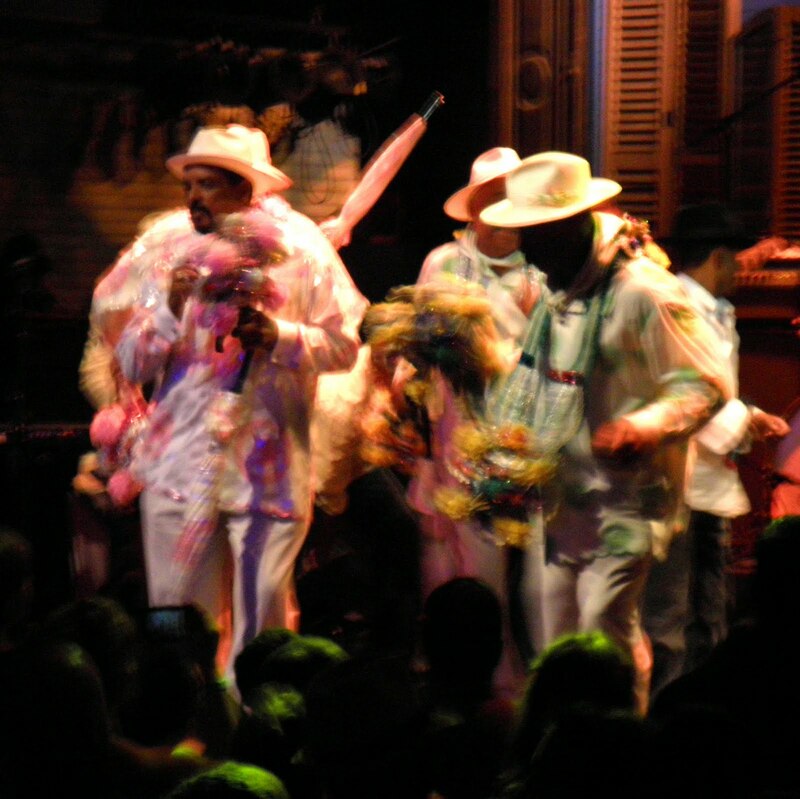 ), John Boutté, Kermit Ruffins and Jon Cleary did their thing before giving way to the grand finale, an unbelievable blowdown with the Rebirth Brass Band being joined by James Andrews, surrounded by Guardians of the Flame Mardi Gras Indians and Treme Sidewalk Steppers just funkin' it up. We had us a time up in there, bra! 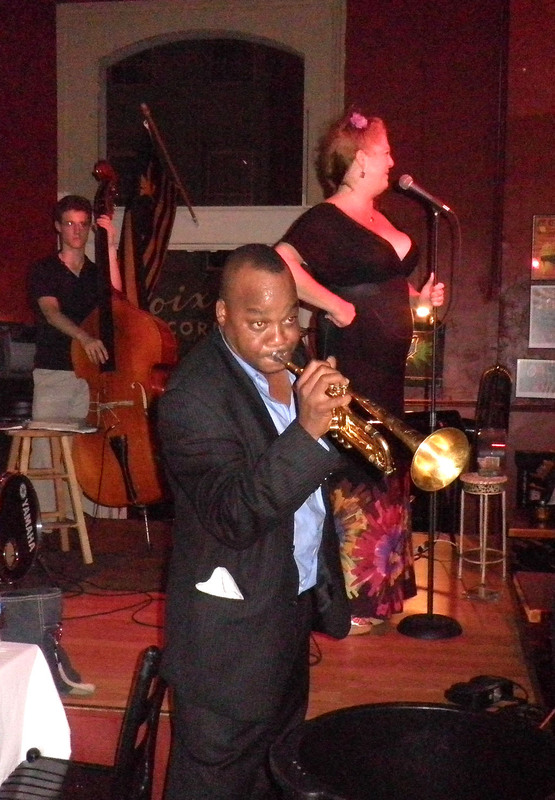 It was James Andrews that stole the show, however, with the high energy trumpet playing and vocals that have earned him his nickname of Satchmo of the Ghetto working the crowd into a frenzy. At the 'after-party' later on he wasted no time, jumping in there and playing with the brass band out on the patio, and just kicking things up a notch. Suddenly the light bulb went on... I had mentioned him in something I wrote way back in 2005. It was no wonder he was such an incredible performer - he was Jessie Hill's grandson! 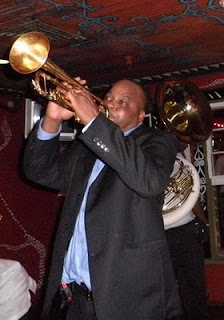 James, in addition to coming from a musical family that also included Papoose Nelson and Prince La-La, studied with the man who is credited with breathing new life into the Brass Band tradition, Danny Barker. Along with his younger brother Troy (now known as Trombone Shorty), Andrews came up out of Barker's legendary Fairview Baptist Church Marching Band and just kept on blowing. Strongly rooted in the tradition, he would hang around Preservation Hall as a kid and kind of soak it all in, learning from legends like Milton Baptiste and Percy Humphrey. As we walked out of the House of Blues, James - in true New Orleans fashion - couldn't resist strolling into the first bar we passed that had a live band, and sitting in. 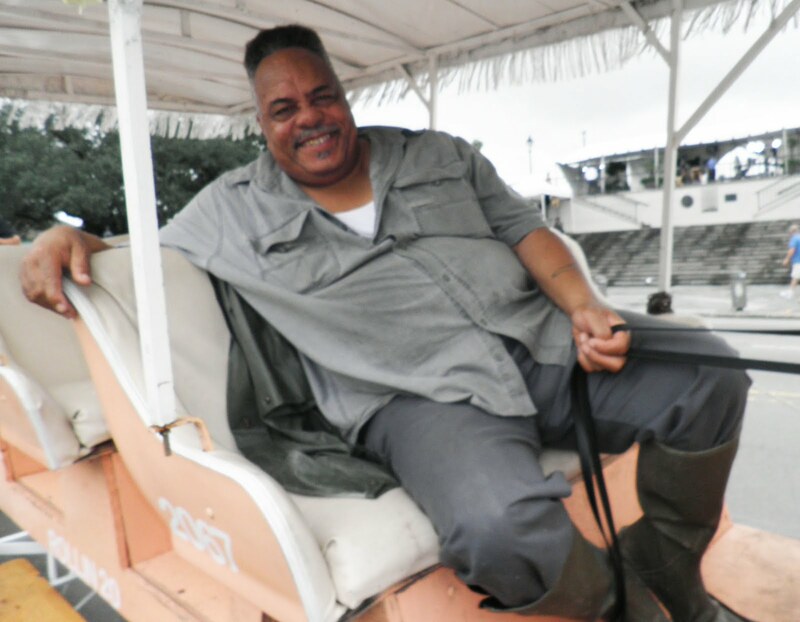 His genuine passion for the music and his gregarious personality combine to make him one of the most-loved figures to come out of the Treme Brass Band scene, and one of its greatest ambassadors. As he told Ken Burns some years ago, "A lot of people try to portray Jazz as being intellectual... but for us in New Orleans, it's more of a down-home thing. I look for the more extreme feeling... that's what makes us so well known - we put the horn stuff on top of that fabulous beat, man." ...just like his legendary Grandfather, James told me that he's all about 'creating a disturbance' - yeah you rite! James Andrews will be performing all this week as part of the Generations in Jazz Festival at Lincoln Center in New York, where they will be celebrating The Wonderful World of Louis Armstrong. Don't Miss It! Below is my original post about Jessie Hill from November of 2005 (which had been taken down in one of those DMCA corporate raids)... thanks! The importance of the disc jockey in the R&B market cannot be overstated. If a hot DJ liked your record and plugged it on the air, you were pretty much guaranteed a hit. 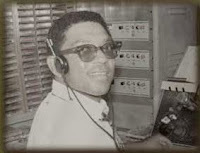 The hottest DJ in New Orleans back in 1960 was a cat named Larry McKinley. Many's the R&B classic he "broke" on his show and sent on it's way to the top of the national charts (not the least of which was Ray Charles' "What'd I Say"). It was a stroke of brilliance when vinyl distributor Joe Banashak asked him to be a partner in his new label, MINIT records. Talk about air time! In January of 1960, McKinley arranged to hold an open audition at WYLD studios as a way of scouting talent for the new company. That one night resulted in the signing of Benny Spellman, Aaron Neville, Allen Orange and Jessie Hill (Irma Thomas and Joe Tex also tried out but were still under contract to other labels). Allen Orange brought along a piano player to accompany him, one Allen Toussaint. He ended up playing behind most of the other folks who had shown up, and so impressed McKinley and Banashak that they asked him to be the new label's producer and arranger. 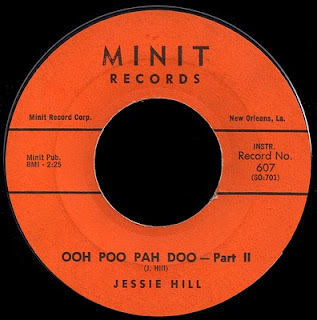 Jessie Hill was a drummer that had worked with such luminaries as Professor Longhair, Bobby Marchan, and Huey "Piano" Smith as well as with his own group, "The House Rockers" (Longhair claimed he was the only drummer who could keep up with him!). He brought a "raggedy" tape to the audition with him of a tune he had written that was just tearin' it up at his live gigs. That song was the immortal Ooh Poo Pah Doo, and Minit decided to go with it. Toussaint produced the session, playing piano along with Jessie's regular band. The record broke big in New Orleans, and absolutely buried poor Al Johnson's Carnival Time as the big Mardi-Gras record in 1960. After Banashak worked out a few kinks with national distribution, the song just ate up the R&B charts. Although it was the truly incredible Part 1 that was creating a disturbance in everyone's mind, and has become a perennial Carnival classic, it was today's B side, Part II, that crossed over to the pop charts and actually is listed as #28 in Billboard's Hot 100 for 1960 (I guess white America just wasn't ready for Jessie's vocals...)! This track provided the first national exposure of Toussaint's piano based productions and laid the groundwork for Minit's string of big hits. It also is one of the first recorded examples of true "9th Ward Music" - that infectious call and response funky thang that guys like Eddie Bo and Oliver Morgan (who jammed with Jessie as neighborhood kids) would run with so well. In addition to good ol' Alvin Robinson on guitar, The House Rockers at this point also included the awesome David Lastie on sax, as well as future AFO Executives John Boudreaux on drums and Richard Payne on the bass. They went out on a national tour to support the record, making it as far as the famed Apollo Theater in New York City. Jessie had never seen that much money in his life, and apparently was blowing it as fast as it was coming in, without saving too much for the rest of the band. Before they even got back to New Orleans, the group had broken up for good. Minit released a few more singles on him, but Jessie never was able to match the success of his first hit. 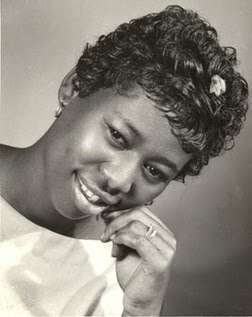 In 1961 he discovered a young singer named Barbara George and brought her around to Harold Battiste's newly formed AFO records along with his brother-in-law, Lawrence "Prince La-La" Nelson. 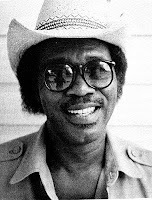 George went on to score the number 3 record on the pop charts that year, while La-La would become the stuff of New Orleans legend. The following year Jessie left town on a tour with Joe Jones and just walked away, winding up in California. By the mid-sixties he was working with Battiste, Rebennack and the rest of the NOLA in exile crowd in L.A.. He had never stopped writing music, and teamed up with Rebennack to form a publishing company called "I Found It Music". They would hole up for days at a time and crank out tunes for Battiste's productions on ATCO and PULSAR. BMI lists Jessie as the author or co-author on 132 tunes covered by artists ranging from Sonny & Cher to Ike & Tina Turner to Paul Revere & the Raiders! He teamed up with Shirley Goodman (of Shirley & Lee fame) to record some duets for Wand records (Jessie and Shirley also became founding members of Dr. John's "Night Trippers", appearing on the voodoo classic Gris-Gris), and released a few singles of his own on Pulsar and Chess, without much success. A universally panned album, "Naturally", was released on Blue Thumb records in 1972. Some time in the eighties I saw a show upstairs at The Village Gate (now a CVS pharmacy...ugh!) in NYC; Dr. John along with Allen Toussaint and Jessie Hill... My, My! Toussaint on piano, Rebennack on guitar, and Jessie just brought down da house! The 90s were some hard times for "Poo". Years of heroin addiction and booze began to take their toll. Despite a few benefits held for him around the Crescent City, there were reports that he was actually homeless for a while. 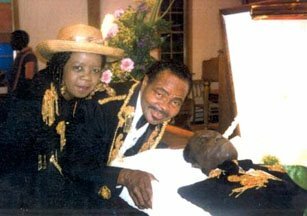 When he died in 1996, Antoinette K-Doe made matching outfits for herself, Ernie, and Jessie (as pictured in the truly bizarre, only in New Orleans photo at right...). He left behind 14 children, and 50 grandchildren (one of whom, James Andrews, is following in his footsteps, making records with Allen Toussaint and Mac Rebennack!). Jessie's Minit material is available on CD. They called him The Most! I found our friend Tony Owens down by Jackson Square, where he is most weekends, working his 'Trap & Mule' for the tourist crowd. He is fondly remembered by everyone in the neighborhood as possibly the greatest Soul singer to ever rise up out of the Treme, as well as being the proprietor of the sorely missed Tony's Lounge up by Armstrong Park. When I asked him how come he wasn't asked to be in the TV show, he just kind of shrugged. If anybody from HBO ever reads this, do yourself a favor and sign him up! Red, Thanks for a fantastic post!